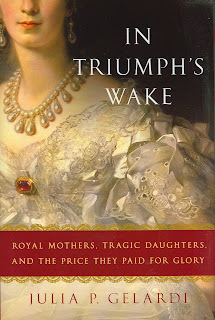 Royal mothers and daughters are the subjects of a fascinating book by Julia Gelardi titled In Triumph's Wake. The lives of three dynamic queens and their less fortunate daughters are explored in a way that makes history come alive. While the three mothers in the book (Queen Isabella of Spain, Empress Maria Theresa of Austria and Queen Victoria of England) were all successful and admired, their daughters were not so fortunate. Gelardi examines the lives of these extraordinary women, the times in which they lived, and the mother-daughter relationships in an attempt to discover why the daughters were not able to recapture the success and admiration of their mothers. The book begins with the story of Queen Isabella of Spain. For most Americans, she is known mainly as the monarch who financed the voyages of Christopher Columbus when he discovered the new world. In fact, she was an amazing woman who managed in her lifetime to do something that many male monarchs had been unable to do: unify Spain and drive the Moors out of the Iberian Peninsula. Extremely pious and devout, Isabella was determined to make the area now known as Spain an entirely Christian area. She invaded Moorish-held areas, and personally appeared on the battlefield to monitor the situation and inspire the troops. In fact, several of her children died at birth due to her exertions while heavily pregnant. Isabella also oversaw some less than commendable events in history, such as the beginning of the Spanish Inquisition and the expulsion of Jews from Spain, in an effort to Christianize the country and save the souls of her subjects. During her lifetime she was greatly admired and was known as "the Wonder of Europe." This allowed her to arrange advantageous marriages for her children. Unfortunately, of her 5 children, only one (Maria, who married the King of Portugal) was happily married. Isabella's youngest daughter, Catherine of Aragon, was betrothed at age three to Arthur, the Prince of Wales, son of King Henry VII. In something of a contrast to most women of the day, young Catherine and her sisters were given an extensive education. They learned not only such "womanly" arts as music, spinning, weaving and sewing, but also law, religion, history and Latin. Catherine also spoke German and French, in addition to her native Castilian. Because it was known from her childhood that she was destined to become the Queen of England, it is a bit puzzling why no one thought to teach her English. When she finally sailed to England to meet her soon-to-be husband for the first time, she had to converse with him and his family in Latin. Catherine and Arthur were married as young teenagers, and sent to a damp, drafty castle to begin their marriage. Arthur died after only 5 months, and Catherine was left alone (well, except for the 150 servants she brought with her from Spain). King Henry VII, her father-in-law, refused to give her any money, and she suffered greatly, eventually pawning items in order to feed and pay her servants. Luckily for Catherine, King Henry VII died, and his son, Henry ascended to the throne. Henry had always admired Catherine, and so after gaining permission from Pope, they married. Catherine was now the Queen. However, although she gave birth to numerous children, only one, Mary, survived. After nearly 20 years of marriage, King Henry VIII became obsessed with Anne Boleyn and determined to prove that his marriage to Catherine had been invalid. Catherine fought this, never giving up, even after King Henry broke with the Catholic church over the matter. Catherine was displaced and separated from her daughter Mary, eventually dying at the age of 50. Throughout her many trials, Catherine maintained a dignity and strength of purpose that won her the respect of many of her former subjects. In fact, several of them, including Sir Thomas More, were executed in part for their support of Catherine and refusal to go along with the king's wishes. Moving forward several centuries, we meet Empress Maria Theresa, who at age 24, upon the death of her father, became Queen of Hungary and Bohemia and Archduchess of Austria. At the time of her ascension to the throne, her disparate empire was in chaos: warring factions, an impoverished treasury, poorly trained troops, and many opportunists eager to take advantage of the situation. To make matters worse, Maria Theresa's husband, Francis, was a weak and ineffectual military leader, who had little respect among the nobility. Almost immediately, Maria Theresa was tested as various parts of her empire were besieged by war. Other countries in Europe, whom she was relying on for help and support, had troubles of their own. Only England came to her aid, calling her, "the Joan of Arc of the Danube." With their support, Maria Theresa was able to limit the amount of damage and hold on to most of her lands. Once the military situation was stabilized, the empress set about reforming taxation (moving the bulk of it from peasants to the nobility), education and the army. Marie Antoinette, the youngest daughter of 16 children, was born "at the zenith of her mother's glory." Her marriage to the future King Louis XVI of France was arranged when she was still a child. She was regarded as intelligent, but frivolous and lazy. Her education was not very extensive, given her nature. At age 14, she left to begin her married life and prepare to become Queen of France. As with Catherine of Aragon before her, she had no close friends or confidants in her new home. At the age of 20, she became the queen and immediately began living the extravagant lifestyle that gained her the enmity of the people. The peasants were overtaxed and starving, yet she persisted in displaying outlandish hairstyles, lavish jewels and decadent finery. Her mother continued to write disapproving and increasing alarmed letters to her daughter until her death in 1780. Unlike Catherine of Aragon, Marie Antoinette had her husband's devotion, but the people she ruled despised her. After a "trial", she was found guilty and executed in the same year as her husband, 1793. Nearly 25 years later, the woman would would become England's longest-serving monarch, Queen Victoria, was born. Her father died when she was only 8 months old, and her mother, the Duchess of Kent, raised Victoria in near isolation. She had few visitors and almost no childhood playmates. Her future husband, Prince Albert, also had a somewhat unusual childhood. His mother ran off with an army officer when he was only 5 years old, and she never saw her children again. After becoming queen at age 18, Victoria set out to find a husband and was more than thrilled with her marriage to her cousin Albert. Victoria, however, was definitely the ruler. She took great comfort in Albert's counsel, but it was she who held the reigns of power. Their firstborn child, Vicky, the Princess Royal, was betrothed at age 11 to the 20 year old Prince Frederick Wilhelm (Felix) of Prussia. At age 17, Vicky and Felix married, and Vicky, like Catherine of Aragon and Marie Antoinette before her, set off for a strange land far from her beloved family. Vicky was dismayed at her new surroundings. Her living accommodations were old and far from comfortable, and her new in-laws were uneducated, militarily obsessed, and condescending toward the new princess. A year after her marriage, she gave birth to the future Kaiser Wilhelm II. It was a very difficult birth, however, and the child suffered permanent damage to his arm which rendered it useless to him. Mirroring Marie Antoinette's experience, Vicky was never accepted by the subjects of her new country and was viewed with suspicion. Even her own son, Willy, believed that she was more loyal to England than to Prussia. Vicky's husband, Felix, became ill with throat cancer before ascending to the throne, so that he and Vicky ruled only 99 days. They had spent their 30 years as a couple planning reforms for when they gained power, yet they were unable to implement any of them. Vicky's son Willy immediately entered his parents' home after the death of his father and ransacked it, looking for "papers." Vicky and her son never reconciled. Vicky, known as Empress Frederick after the death of her husband, eventually died in 1901, the same year as her mother, Queen Victoria. Queen Victoria was the only mother who lived to see the suffering and final days of her daughter. The other mothers, while aware that their daughters were living in perilous situations, were spared the experience of watching them reach their final fates. While the mothers were all strong Queens in the countries of their births, the daughters were married off as consorts and were never truly accepted in their adopted countries. Although many centuries separated the mothers and daughters, there were so many parallels that it was as if history was repeating itself. Overall, this was a very interesting and enjoyable book that helped to make historical women "real people" rather than just names in a history book.